I've had the above service listed on my site as a link for several years, but only today paid for and downloaded a track for a student of mine (she wanted a metronome assisted version of the piano part to Gaubert's Fantasie to save on rehearsals with the pianist). I used my PayPal to pay the approximately $10 for the piece, and was immediately able to download it (they also accept credit cards.) The whole process took less than five minutes. It's a good quality, well thought out accompaniment track on mp3 of the entire work played by an intelligent pianist. I'm very satisfied with the price and the quality. 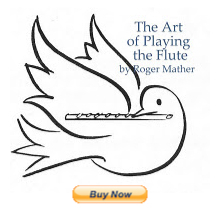 PERFECT for the flutist to work with in the last few weeks before a studio recital. I just looked at this website. Not bad, but all samples I heard sounded very synthetical. Are they really played by a pianist or by electronic piano? I do not really love the Mozart concertos with piano accompaniment. I think we need an orchestra for this, hahahahaha! You might like to know about our site YourAccompanist which specialises in accompaniments for singers, not flautists, but the library is huge and might contain accompaniments which could be used by flute players. The quality is great and it's only about $2 a track. We also have free harmonised scales which are downloaded, used and loved by many types of instrumentalists. My gosh, thank you so very much for these links. I tried the scale accompaniments and they are FABULOUS!!! I also have a website offering accompaniments, all the tracks are recorded by me, not midi files and we provide three recordings at different tempi for practice purposes. I am always adding more tracks and will guarantee to provide any piece on the ABRSM flute syllabus within a week. I've just tried Exam-accompaniment.co.uk. The quality is great and the choice of speeds was really useful. Some time ago I purchased tracks for this website. I absolutely adore them. I returned not so long ago and asked about the possibility of additional tracks. The email response I received is that sadly the pianist passed away so no additional tracks would be added. Using this link again more recently it no linger seems to be valid. I presume that it is no linger being maintained since her sad passing. Melody Lord is the artist. I love her tracks and have found them to be the best recordings I've found. It's such a shame she passed away and won't be adding to this collection. However I'm pleased I can purchase the tracks I didn't download before.